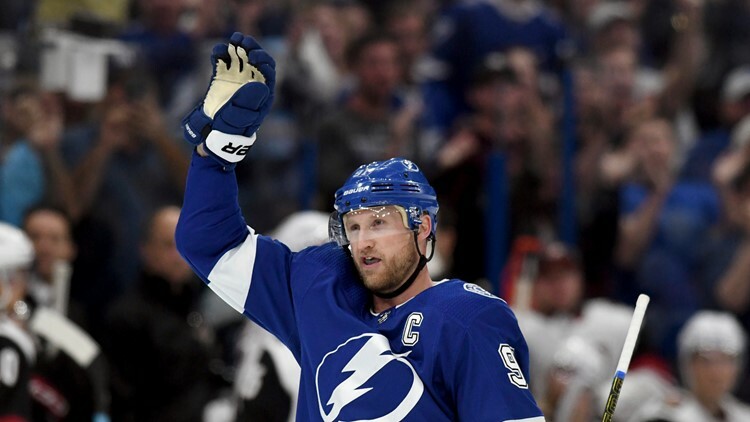 Tampa Bay Lightning center Steven Stamkos (91) waves to the crowd after becoming the all-time franchise goal leader (384) with his first-period goal during an NHL hockey game against the Arizona Coyotes, Monday, March 18, 2019, in Tampa, Fla. They will have home-ice advantage throughout the playoffs. TAMPA, Fla. — There's a storm a-brewin' in the NHL. With a 4-1 win against the Arizona Coyotes on Monday, the Tampa Bay Lightning clinched the Atlantic Division title, the Eastern Conference title and the NHL's President's Trophy. It's a mouthful, but the Lightning will have the home-ice advantage throughout the upcoming playoffs. And to top it off, team captain Steven Stamkos became the franchise leader in goals with his 384th. The team has nine regular-season games left and play the Washington Capitals on Wednesday on the road.